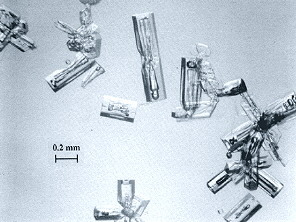 Crystals collected during a superb South Pole display on 17th January 1986. Apart from a few small air bubble inclusions, the crystals really are like their hexagonal plate and column ideals. Crystals from a mediocre halo display 16 days earlier. They have large inclusions and their faces are imperfect. Photographs from 'Atmospheric Halos by Walter Tape' reproduced with permission. Not all cirrus clouds produce halo displays. Why is this? When their ice crystals are smaller than ~0.01 mm (10 micron) light is significantly diffracted and any halos are weak and diffuse. Crystals larger than 0.05 mm refract and reflect light cleanly to produce halos. The sharpest halos occur when the crystals have precise alignments and this needs crystals larger than about 0.1 mm. 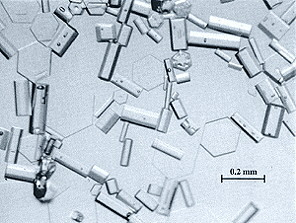 Very large crystals of 1 mm or more are rarely of sufficient optical quality and have defects which spoil their halos. They also have an increasing tendency to wobble and lose their alignments. So the crystal sizes, alignments and optical qualities are sometimes not right to give good halos. But always check the skies for sometimes the conditions are perfect!